My Perect 10 was taken on November 21,2009. It was the first day of gun season and I entered the woods that morning toting my Remington 300 Ultra Mag. I recall feeling a little down since I had hunted harder than I ever had in previous years during bow season. This was my second year without taking a buck with my bow. I remember hearing my alarm go off at 5:30 that morning and I hit the snooze and decided I was too tired to get up. Then it hit me "This is opening day". So I reluctantly went through my scent free routine and drove the 1/2 hour out to my buddy's property. Once I arrived at my stand I set off a "Buck Bomb" and climbed up and waited. To my surprise my wait was short lived. At 7:30 I heard what I initially thought were a couple of squirrels rustling through the leaves. Then the noise grew louder as the buck neared. Minutes later inside 40 yards I spotted a quick glimpse of his rack.I decided to take him, so I looked ahead of his path for the nearest opening. I carefully took aim and fired. The impact dropped the buck instantly and I was elated. After a minute or two I was still trying to compose myself as I climbed down the ladder I heard a loud ruckus. I had taken a few bucks with my 300 before and it never took more than one shot. So needless to say I was in total shock to see my buck standing perfectly erect staring right at me. He took off down the hill and dropped about 75 yards. As I took chase after him I saw him looking up at me still trying to get up! I fired once again and realized now he was "My" Perfect 10. 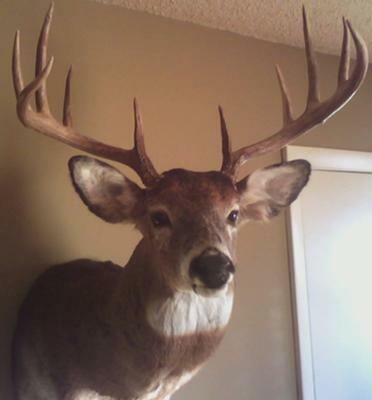 Unofficially the buck scored 141 1/8 with an inside spread of 21 1/4". I'm very proud of my buck and after viewing my post season trailcam pics I have very high hopes of filling a bow tag this coming season.